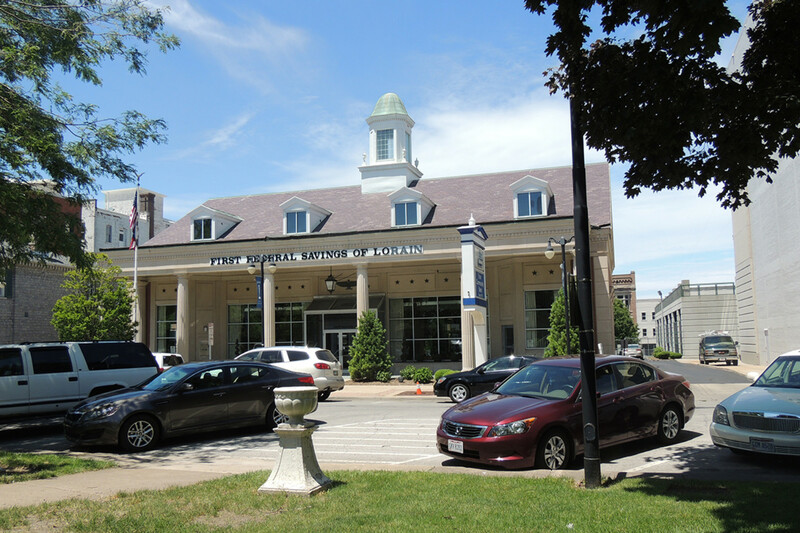 In September 1991, First Federal Savings of Lorain opened this branch and continues to operate it today. Although the corner wing of the Sloane House Hotel was demolished in the late 1940s for construction of the Lasalle’s building, the remaining part of the hotel along West Washington Row was not included in the department store’s development. This section of the Sloane House actually kept operating as a hotel until September 1954, when it was closed by its owners so that the building could be remodeled into “a mercantile structure.” Though the hotel was closed, its two remaining first floor businesses, Schaefer’s Jewelers and The Sloane Bar, remained open. As a result of the collapse city officials ordered the complete demolition of the Sloane House, and this work was finished by late 1957. For about the next 10 years, the site was then used as a parking lot for the downtown area. Several years after building the Sloane House, Rush R. Sloane also constructed the Sloane Block to the west of the hotel along Washington Row. The Sloane Block was a four story commercial building that was home to several notable businesses during its existence including Brohl and Appell Plumbing and Heating, Parkview Barber Shop, and The Kubach and Buderer Pharmacy. After demolishing the Sloane Block, Savings Building and Loan constructed the current building on this site, which opened in 1970. The bank also used this same building design for its Huron office on Liberty Avenue, which was built as part of that city’s urban renewal project. Savings Building and Loan became the Erie Islands Division of First Federal Savings of Toledo in 1986, but this Toledo bank was ultimately taken over by the U.S. government’s Resolution Trust Company as a result of the savings and loan crisis that occurred in the late 1980s and early 1990s. In September 1991, First Federal Savings of Lorain acquired this branch and continues to operate it today.